There are tons of flagship phones with monstrous screens and top of the line specs that appeal to power users and those with deep pockets. However, not everyone really cares for a phone that boasts a larger than life display, nor are top of the line hardware and benchmark-setting-specs a necessity for someone who isn't trying to become a multi-tasking mastermind with their smartphone. This is where 'Mini' versions of popular flagship phones come in. They're supposed to compromise on some specs, but not style, and still offer a decent user experience at a fraction of the price. But it seems Oppo didn't receive the memo on the price part. 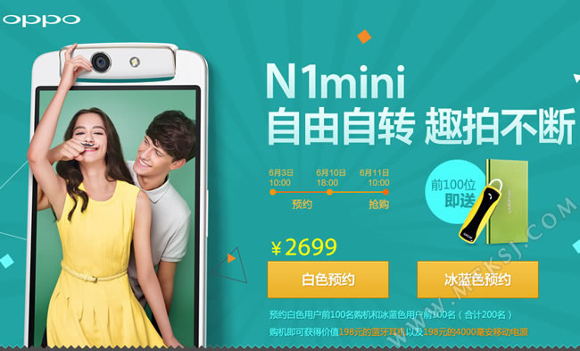 The Oppo N1 mini will retail for 2699 Yuan, which equals $431 USD; not exactly cheap. For comparison, the N1 Mini is roughly the same price as the upcoming HTC One E8, which is basically a plastic version of the One M8. Specs wise, there aren't any official details given by Oppo, but rumor has it the device will sport a quad-core 1.6GHz processor, a 5” 720p HD display, a 13MP rotating camera, and a 2140mAh battery with Android 4.3 Jelly Bean. There has also been a report of the Oppo N1 Mini only having 2GB of internal storage, but this very well could be the amount of RAM (hopefully) that the device is packing. A mini with a 5" display ? Are they serious ?